As summer approaches, the temperatures may be rising, but the unemployment rate is falling. For the second month, the national unemployment rate remained below 4 percent; this month it is 3.8 percent, lower that expected and the lowest again in almost 20 years. 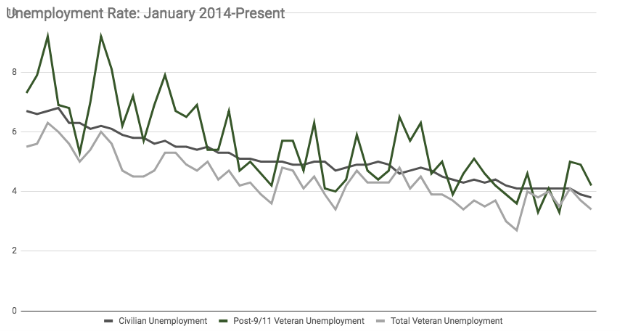 The veteran unemployment rate, including all eras of veterans, fell to 3.4 percent. However, the post-9/11 unemployment rate continued to be higher than the national and veteran population unemployment rate at 4.2 percent. It’s a far cry from just three months ago, when we saw the lowest unemployment rate for the post-9/11 generation. However, it’s still a fairly low number overall, and a downward turn from the past few months, so overall, this is a good news story. May’s Unemployment Report hit just as the IAVA team is welcoming our top advocates and member leaders to Capitol Hill for our 2018 Summer Storm the Hill. For the next week, IAVA member leaders will be advocating for IAVA’s top priorities, including IAVA’s Big 6 Priorities, to lawmakers and decision makers around Washington, D.C. Employing the new greatest generation is in our latest Policy Agenda, and our Big 6 issues, like health care and education, impact employment. That’s why we’ll be spending the next week on Capitol Hill advocating on the issues that impact the Post-9/11 generation most. We know employment is a top concern for IAVA members. See all our recommendations in IAVA’s Policy Agenda here. And keep up with our Summer Stormers on StormTheHill.org.